From the early nineteenth century Yeovil developed into one of the country's main centres for leather production and glove making. Documentary sources indicate that by 1840 approximately 75% of the town's population were employed in the leather or gloving industries. Also, as these industries grew, so the population of the town grew - fourfold between 1801 and 1851 (2,774 to 8,739). It remained Yeovil's principal industry throughout the nineteenth century and continued to thrive until the mid-twentieth century. Many leather and gloving factories sprang up in the town but there is little today to remind us of these former industries. 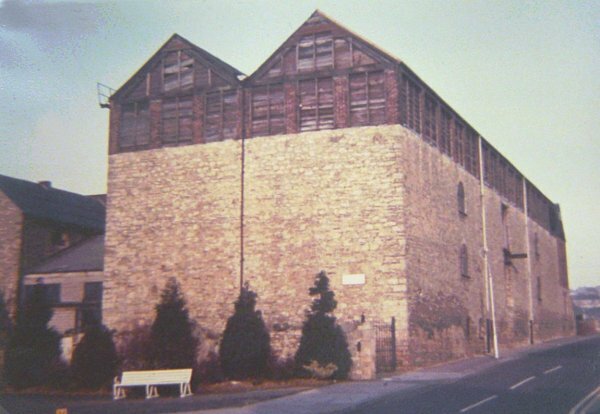 Around 1828 (not 1850 as frequently recorded) William Bide Snr, a prominent leather and glove manufacturer, built the large leather dressing factory with a four-storey leather-dressing warehouse on the corner of Kiddles Lane (now Eastland Road) and Reckleford. William died in 1830 and the factory was left to his son, William Bide Jnr, and described in his will as a "newly-built glove factory, a yard and an old loft adjoining and around with a wall and parting door." William Jnr employed over 250 men and women, with more than 2,000 outworkers. These outworkers were usually women and girls who undertook sewing in their own homes, collecting and returning their bundles each week. In the outlying villages delivery of leather and collection of gloves was carried out weekly by Bide’s own transport. 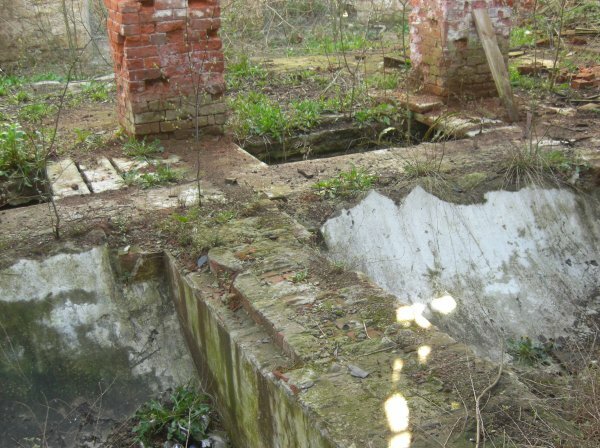 William Jnr erected stone-built cottages for his employees in Reckleford, on land adjoining the factory, at the same time providing pumps for the water supply. These cottages were only demolished for the widening of Reckleford in the 1960’s. 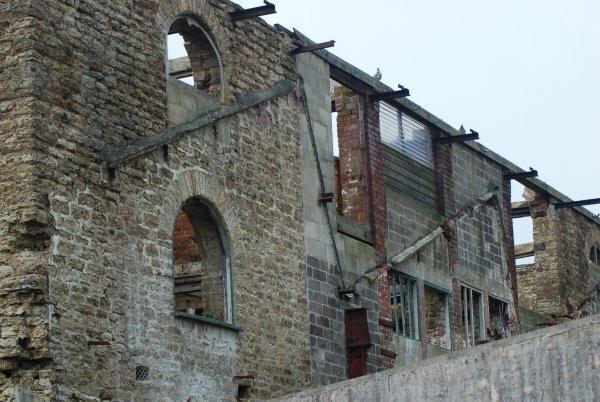 The Eastland Road Dressing Yard and Tannery, one of the town's last links with its industrial past, was originally four storeys, the lower three storeys built in stone while the top storey, now removed, was in timber as seen in some of the photographs below. 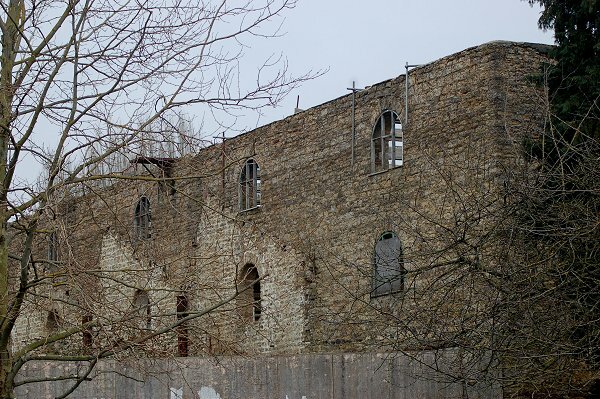 The main building was built in random coursed local stone, with some brick piers with timber infill at high level under slated roofs (now removed). 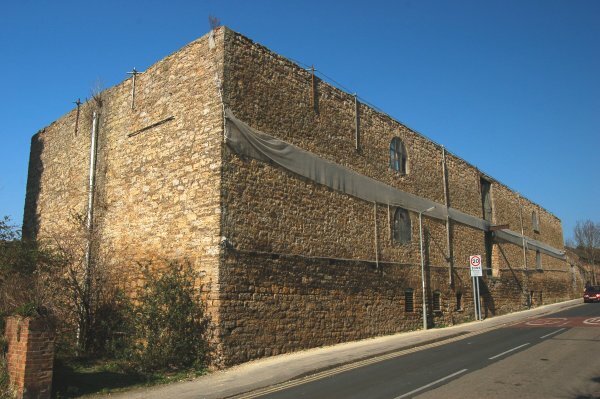 The original and main block, along Eastland Road, was of four storeys with a double pitch gable end valley roof It had six arched windows at the lowest level, with windows with semi-circular arched heads at first and second floor levels as well as central doors to both levels, with a hoist and roller tackle projecting bar. 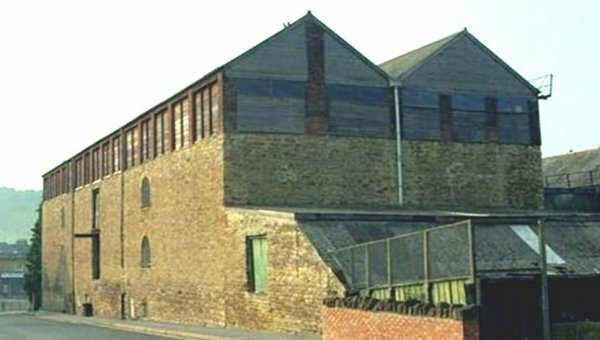 The building was sold in 1883, at which time it was occupied by Whitby Brothers, and the sale description in the Western Gazette described the property as follows "A Leather Dressing Yard, with the Outbuildings and other Premises belonging thereto, situate in Kiddle's Lane, comprising a substantial stone-built and slate-covered building, 137 feet long by 44 feet wide, and four stories high, the ground floor containing 24 pits, and the upper floors forming spacious lofts 133 feet long by 40 feet wide; and also a stone-built and slated building (adjoining the above premises) three stories high, and 122 feet long by 21 feet 6 inches wide, containing alum houses, drying stoves, and large and well ventilated drying lofts. The above premises are well supplied with water from a well and from a rivulet (Milford Brook) running through the yard." Internally brick piers ran up through the full height of the building. The floors were broad elm boards except at attic level, where small boards alternated with spaces between the joists. This wooden upper storey was used for drying the wool from the skins, and these gaps, coupled with louvres in the timber infill of the outer walls, assisted the process. The machinery was originally steam-powered but later driven by electricity and included combing tanks and dressing drums. A second, later, building runs parallel to the main block at the rear of the site, and was joined to it by a twentieth century single storey link block constructed of concrete blocks with corrugated asbestos sheet roof, now demolished. Bide's account books for 1851 indicate that he held a considerable stock of 33,000 skins and finished pairs of gloves, amounting to a total value of £15,000. After William Bide's death in 1864 the Eastland Road Dressing Yard and Tannery was sold to glove manufacturer William Raymond of Goldcroft and was, later still, owned and operated by the leather dressing and glove manufacturing business of the Goldcroft Leather Co Ltd. Latterly it was occupied by the Perrin Leather Co Ltd.
Today it is, sadly, derelict. 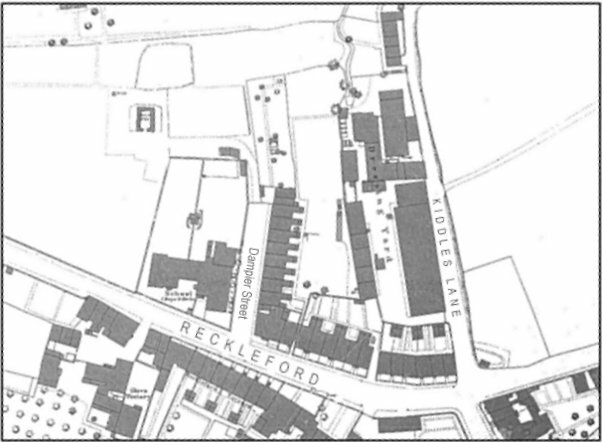 Map based on the 1886 Ordnance Survey showing the large leather factory complex marked "Dressing Yard" in Kiddles Lane (now Eastland Road). 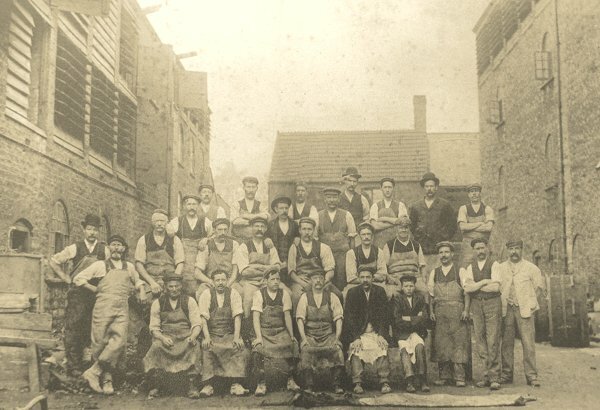 Workers of William Raymond & Sons gather for a group photograph, probably around 1890, in the yard between the main building at right and the 'rear' building at left. A photograph of the late 1950's showing the elevation facing Eastland Road. The rear building of the factory complex is seen at right. This photograph was taken from Eastland Road in the early 1960's and shows the east and north elevations of the main building. 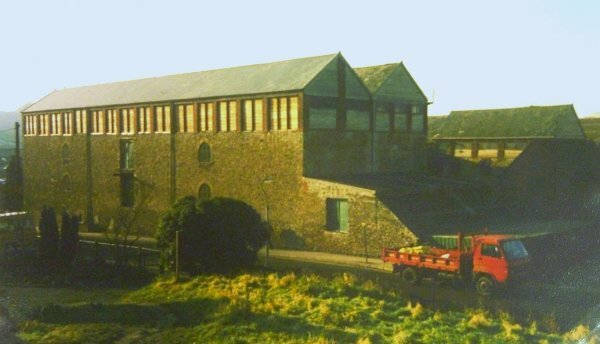 This photograph was taken from Reckleford in the early 1960's and shows the east and south elevations of the main building, at which time it was occupied by Perrin Leather Co Ltd. This photograph was taken in 2013, the week before the current top storey of the structure was covered with unsightly white sheeting. The west elevation of the main building. Note the 'ghosts' of the central connecting buildings. Photographed in 2013. The east elevation of the rear, or western, building. Photographed in 2013. Internal pits for steeping skins. Note also the central brick columns which rise up through all storeys. Photographed in 2013.